See, Brian SWEARS that to make the best coffee, you have to steep the grounds in a pyrex cup and then pour the resulting coffee slowly through a filter. 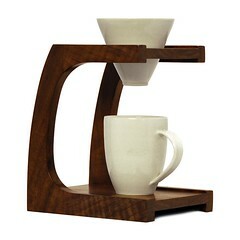 He can show up to explain why this is different and better than a drip coffee maker or a French press. My only concern is that the get-up look cool. The plastic cup-top dripper he’s been using? NOT COOL. That’s why we need the Clive Stand. The price, regrettably, is beyond the pale. I would say it’s a small price to pay for high style, but, you know, it’s not. we have a vintage ceramic version of the plastic cup topper. you can pick them up on ebay. they are pretty sturdy, we take one camping! That’s the way I make iced coffee – cold steeping it in a pyrex bowl over night and filtering the concentrate the next day. Does he heat it up or drink it cold? I got my ceramic filter from http://www.fantes.com. Love it.